Have you ever wondered why we feel cold? A quick look at human physiology provides the answer. Sensitivity to temperature is a skin sense that is related to the human need to maintain internal temperature balance. Temperature sensitivity alerts the body to potential damage from intense temperatures. Specialized sensory receptors called thermoreceptors are responsible for temperature sensitivity. These thermoreceptors are located in the dermis (inner layer) of the skin. Cold receptors are one of the basic categories of thermoreceptors. Cold receptors start to perceive cold sensations when the surface of the skin drops below 95°F. They are most stimulated when the surface of the skin is at 77°F and are no longer stimulated when the surface of the skin drops below 41°F. This is why feet and hands start to go numb when they are submerged in icy water for a long period of time. Thermoceptors are found all over the body with the highest concentration in the face and ears explaining why the nose and ears always get colder faster than the rest of the body on a chilly winter day. When the temperature in the environment drops, thermoceptors in the skin alert the hypothalamus area of the brain. The hypothalamus is the brain’s processing center that controls body temperature among other functions. When we are too cold the blood vessels supplying warm blood to the skin become narrow or constrict. The process is called vasoconstriction. Vasoconstriction reduces the flow of warm blood near the surface of the skin thus reducing heat loss from the skin. As a result, the skin turns paler because less blood is reaching the surface. 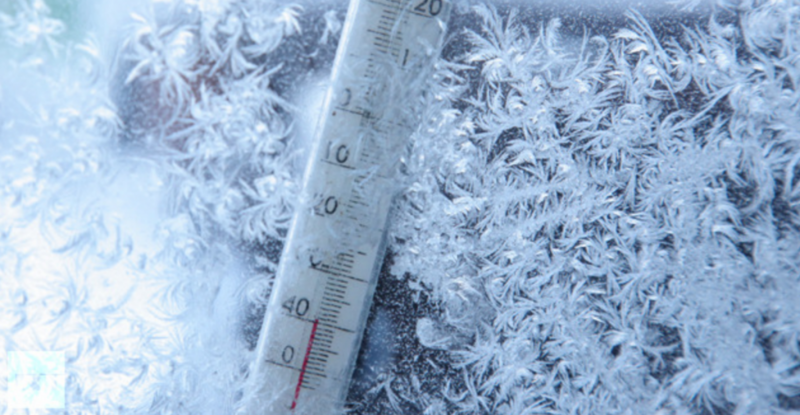 In addition to vasoconstriction, the body responds to cold temperatures in other ways. Shivering – The rapid contraction of muscles during shivering results in heat being produced during respiration. This heat then warms up surrounding tissues. Goosebumps – This reaction occurs when muscles at the base of the hair contract and cause the hairs of the body to stand on end. Goosebumps help to trap a layer of air around our bodies and form a protective insulating layer over the skin. Since humans lack dense body hair in modern times, goosebumps are not as effective at keeping the body warm but the reflex remains. Hormone Release – Hormones and other small proteins are released in order to speed up the basal metabolic rate, essentially eating stored fuels in the hopes of producing heat as a byproduct. Learn about cold stress and other winter weather hazards.